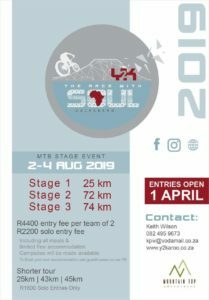 The 6th edition of the Y2Karoo will take place on the weekend of the 2-4 August 2019. The event will once again be hosted by the Colesberg high School and will be held over 3 stages. They have again fine tuned the route and made some amazing new changes. Even more jeeptrack and singletrack can be expected with a suprise or two. Since this is a event that caters for everyone we will once again have no cut-off times. You can take your time through the beautiful Karoo scenery and simply enjoy a 3 days of mountain biking. R4400 entry fee per team of 2 riders and R2200 entry fee for solo riders. Included in your entry fee you will receive limited free hostel accommodation as well as all your meals. Campsites will be made available Karoo people are renowned for their hospitality as well as the best lamb in the world. You will certainly not go home hungry after all the lekker potjiekos and braaivleis.